Alexander the Great, known as the world’s greatest empire builder had his target on Persia. Two barriers to achieving his goal of conquering were present: the Greeks were less in number when compared to the other army and the Persians had the most powerful naval fleet in the world. 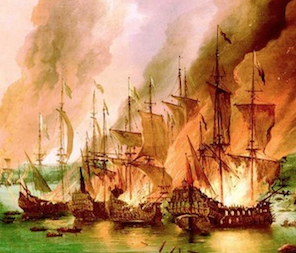 Thinking that his men would run away when realizing the poor odds of winning, Alexander burned his boats. There was no return. All that was left was to fight and conquer… so they did. Uncertainty, doubt, fear, and hopelessness are feelings that usually paralyze us. Frequently, we are trying to achieve a goal or change something with which we are not comfortable. We strive for more. In fact, this comes naturally for us as creatures of a Mighty God. He created us with a purpose. We are part of His plan for the world. Nonetheless, sometimes our human thinking prevents us from seeing what God sees; an immense frame of colors with carefully delineated figures and trails called His plan for our life. For some, this vision has been shattered by unhealthy family relationships, hurtful memories, past experiences, and failures. … so we fear. Scripture tells us in Mark 5:25-34 about a woman who suffered for twelve years with constant bleeding. Numerous doctors had seen her and all her money was spent on them, yet her disease worsened and there was no hope for her cure. But in her heart, deep in her soul and spirit she was not defeated. This can’t be over! Just imagine! After twelve years of suffering she still expected something to happen. She knew Jesus was coming. She believed He would bring her healing. The odds were against her; she was a woman and an “unclean” one at that. It was going to be difficult for her to get to Jesus with that many people, and there was no more hope from the experts who had treated her. On her way to encountering Jesus, this woman “burned” her fears, her pain; both physical and emotional, her doubts, and the words of hopelessness. She burned the word impossible. She knew that without “burning” all of these, she could not get to the source of her healing, to the source of new life. “Oh, if I can just touch his robe, I will be healed”, she thought to herself. She did and she was. Jesus said to her, “Daughter, your faith has made you well. Go in peace. Your suffering is over.” What a moment for that woman! What a great way to start a new life! Her faith guided her to conquer. As Alexander the Great and other great conquerors, we will come to a historic moment in our life where we need to “burn our boats”. The “boats” of conformity, fear, the “I can’t do this” boat, the boat of “the old ways were better”, the boats of self-pity and frustration. Think for a moment. Give a name to your boat. Start this new year by burning your boats on the shore. Leaving no way back! Let the power of the Holy Spirit burn the barriers that are precluding you from living the way God wants you to live.